She has been a successful Ear-Nose-Throat (ENT) Specialist for the last 9 years. She is a qualified MBBS, M.S(ENT). 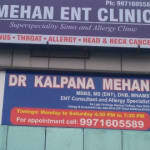 Book an appointment online with Dr. Kalpana Mehan on Lybrate.com. Find numerous Ear-Nose-Throat (ENT) Specialists in India from the comfort of your home on Lybrate.com. You will find Ear-Nose-Throat (ENT) Specialists with more than 27 years of experience on Lybrate.com. Find the best Ear-Nose-Throat (ENT) Specialists online in chandigarh. View the profile of medical specialists and their reviews from other patients to make an informed decision. Meri age 31 years old hai mere dono kaan 15 saal ki age se behna shuru ho gye the but maine iska ilaaz nahi karwaya lekin ab check karwane pr pata laga ki dono kaan ke parde phate hue hai or change karwane k liye kaha Main iski cost janna chahta hu. Hello lybrate-user first of all ,you should know that it's very important to get your ear surgery done ,other wise it may get complicated, and infection can spread to brain which leads to serious complications. The cost of surgery depends upon grade of disease. Simple ear drum repair surgery charges 25, 000_30,000, whereas extensive surgery cost around 40,-45,000 per ear. Take care Regards. I am suffering from nasal poli last 7 years. My nose remain almost block all year round. I can just take 40% breath. I use otrivin nasal drop but its effect is temporary. Hello lybrate-user You should immediately get investigated. Show it to E N T specialist, get your nose examination and CT scan done. Do not use otrivin off and on, it can trouble you alot. Thanks Take care. I'm suffering from ear pain for 4 months. I am using ear drops but no change. So tell me how to solve the problem to reduce the pain? Hii lybrate-user Ear pain for the last 4 months indicate reffered otalgia which means ear pain not because of your ear it's from some other organ sharing the same nerve supply like tooth or tongue or throat just check if there is any problem in these and go accordingly. EAr drops won't help. Thanks Take care.